Great gyrating arms of the galaxy! Swirling around us. 100,000 light years across, and we’re just a grain of sand within a billion grains of sand. This is real. Right now. 01. Printed on thick, weather proof vinyl. Adhesive x Infinity. 02. Colors inspired the mighty stars & bars of the American flag. 04. Proudly printed by space balls of Diesel Fuel Prints! We exist within the Milky Way! Before you were born and long after we turn back to the star dust we are made of! 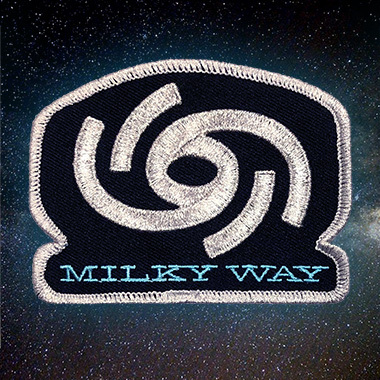 Wear this patch as a proud citizen of the Milky Way! 01. Durable embroidery. Long lasting. 02. 3.5” x 2.0” in dimension. 03. Manufactured by our Portland buddies at Brewery Outfitters. 04. 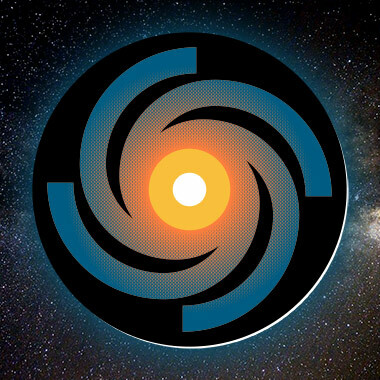 Great for space jumpsuits, space camp jumpsuits, jumpsuits, backpacks, jean jackets, fatigues, rucksacks, feed-n-seed caps and many other spirited uses. 05. Made of star dust.